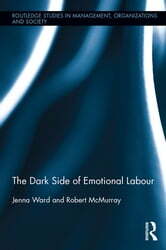 The Dark Side of Emotional Labour explores the work that the rest of society would rather not think about, the often unseen work that is emotionally disturbing, exhausting, upsetting, and stigmatising. This is work that is simultaneously undesirable and rewarding, work whose tasks are eschewed and yet necessary for the effective function of individual organisations and society at large. Diverse and challenging, this book examines how workers such as the doorman, the HR manager, the waiter and the doctor’s receptionist experience verbal aggression and intimidation; how the prison officer and home carer respond to the emotions associated with physical violence, and; how the Samaritan, banker and veterinarian deal in death and despair. It also considers how different individuals develop the emotional capital necessary to cope with the dark side of emotional labour, and how individuals can make sense of, and come to take satisfaction and pride in, such difficult work. Finally, the book considers what is to be done with darker emotional work, both in terms of the management and care of those labouring on the dark side. Challenging and original, this book gives a voice to those who undertake the most demanding work on our behalf. It will be of interest to researchers and students of organisation studies and its related fields, and to every one of us who is called on to work or manage on the Dark Side. ((RING)) ((RING)) The Whistle is BLOWING!